Microchip supplies dedicated slave devices that include a two-wire serial interface that is System Management Bus (SMBus) and I2C™ compatible. The SMBus specification is based on the I2C serial communications protocol, but with some differences. 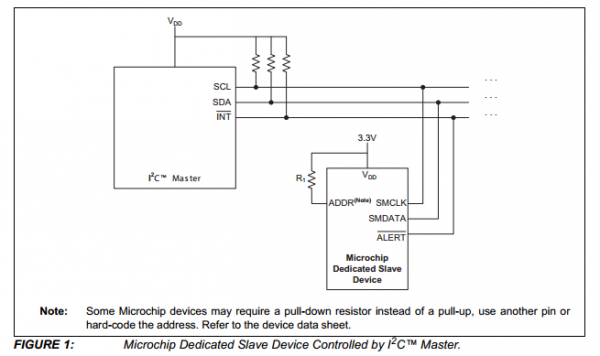 This document describes the key differences that may affect successful application of Microchip two-wire serial interface dedicated slave devices in systems that are designed with an I2C master interface. major differences between SMBus and I2C. This entry was posted on Saturday, December 20th, 2014 at 2:41 pm	and is filed under app notes. You can follow any responses to this entry through the RSS 2.0 feed. You can skip to the end and leave a response. Pinging is currently not allowed.